Hey biz builders! So, let’s talk about that “About Me Page” of yours. Yep, we’re getting right to the point today. Besides being one of the most popular pages on your blog, your “About Me Page”, when done the right way, can become a powerful lead magnet on itself. Yes! Yes! This super special page is where new blog readers get a chance to learn more about the person behind the brand, the biz and the blog. They get to learn about you, what makes you special, and it’s the perfect page to show folks what you’re working with so they want to stick around and find out how they can get more of what you’re dishing out. An About Me Page is not just about telling people who you are, it’s your chance to confidently communicate that you’re the right person for them. It also gives you the opportunity to connect with your perfect fit fans in ways no other entrepreneur can. There are a few key steps you will want to take to turn your About Me Page into a list building, brand boosting money maker and I’m going to show you step-by-step how to put it all together. Can I get a whoot, whoot?! Alright, let’s get started! Within the first few sentences, your new visitors should be able to make a clear cut decision on if your blog is the right blog for them. That means YOU have to get 100% clear on who you serve and the value you bring to the table. I mean really, how can you convince someone to work with you if you don’t know what you have to offer them? Your About Page should be ALL about the value you give to your readers. Yes, people want to know about you, but they care more about what you can do for them, than if you love macarons and trips to Paris. We live in a “what have you done for me lately” society. So, let people know right off the bat what YOU can do for THEM. Before you write one word on that About Me Page, make sure you know up and down, inside and out, what makes your blog useful to your readers and who your blog is intended for. Soooo, word on the street is that you’re looking to turn that damn good idea of yours into a profitable business, one that doesn’t require you to wake up before 10am, hop in your car to get to work, or listen to co-workers complain about how much they hate their jobs while piled up around the corporate coffee pot? And, since you’re here right now, I’ll take it as a sign that your entrepreneurial spirit is on fire and you’re beyond ready to unleash the personal brand that is YOU, Inc. into the world. Did you see what I just did? I painted a picture that resonates with the exact type of person I want to connect with and when the right people land on my About Me Page, they KNOW they are in the right place. Now the picture I paint is not going to be the picture everyone who visits my site decides to take home, but that’s okay because we want to connect with the right ones, not everyone. 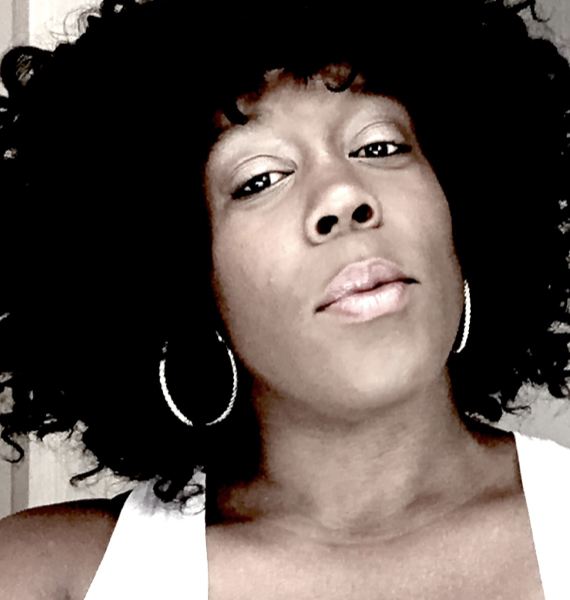 Ready to give you About Me Page a boost? Nab the free actions to plan the perfect page! There are a million and one (maybe more like a gazillion and one) blogs out there and potentially hundreds of thousands that teach on topics similar to the ones that can be found on your site. So, once you’ve confidently communicated WHO you serve and WHAT problem you can help them with, the next question you need to answer is HOW you are going to get it done. Which topics do you specialize in? Highlight the topics you will be talking about. You could write something like: I specialize in topics like online course creation, branding, list-building, and selling through social media marketing. What will they get out of your content? How will someone be transformed, changed, or different after reading your content or purchasing your course? Will they be a better blogger? Will they become a more loving spouse? Will they learn how to rock the perfect outfit at their next holiday cocktail party? Let ’em know what they can expect. Can you show social proof that supports your success? Would you learn to fly a plane from a dog trainer? Absolutely NOT. So, just because the dog trainer says he can teach you to fly, doesn’t mean he can. I know, I know, as new bloggers and biz owners, it’s hard to boast about success you haven’t achieved yet, but even small wins can seem huge to those who are looking to you to help them get started. So whether you are listing all of the big name celebrity brands you’ve worked with OR sharing the new things you’ve discovered as a newbie business owner, a win is a win and something you can build your street cred upon. What is your ultimate goal? Your personal purpose? You can start with something like: Whether you’re a total newbie or have been a #goaldigger for years, my goal is to help you create a profitable + pretty online business you love by monetizing your passions. I know! You’ve got something amazing to share with the world…and I’m here to help you shine like the diamond you are. When people know you care about their ultimate success, they are more inclined to give you the opportunity to show them you can! Share your beliefs, your personal struggles, and your journey, then find creative ways to connect your story to theirs. Let potential customers know that you were once where they are and that through the core values, principles or strategies you believe in, you where able to achieve some amazing things – and with you showing them the way, they can do the same too! How did this become your life? Blogs and businesses get started for any number of reasons and it’s always nice to share how your blog came to be. Was your site born out of an idea to solve a problem you had? Maybe it was a complete accident and something you just kind of fell into? Or shoot, maybe you knew you’d be an entrepreneur from birth? Whatever inspires you to help others, share it! In this section, you should share your life as it relates to your blog and brand but make sure you keep it fun and personable. Talk about how your blog fits into your life — the tipping point that pushed you to start your blog, the exact moment you realized you were meant to do what you do, and your desire to help others explore their awesome-ness too. Also, color your commentary with some random facts and photos of yourself. Don’t forget to share what makes you unique, fun and relatable. If you’re a mom, share it. If you’re obsessed with selfies, share it! Anything that is uniquely “YOU” share it! It’s who you are, and it’s a great way to connect with your audience, so own it! Now this is where you turn an ordinary About Me Page into a money-making About Me Page. Making money online starts waaaaaay before you ask someone to hit the buy now button. It starts the moment they first come into contact with you and your content. As is with most relationships, it takes two to tango, but if you want to up your chances of “sealing the deal” (i.e. turning new blog readers into raving fans) take the initiative and invite people to continue building that relationship. The best way to do this is through a call to action. Most people never think to add a call to action but, after all that writing and sharing, do you want people who think you are super cool and awesome to just walk away and totally forget about your site? (awkward!) Of course not. You want them to take the next step with you, right? Right! A call to action (or CTA) encourages your readers to take a very deliberate and specific action! This invitation could be as simple as asking them to connect with you on Instagram or asking them to subscribe to your free online course. Asking them to subscribe ensures that you stay in touch. Also, it’s smart to include your CTA in a few different spots throughout your About Me Page, preferably toward the top, middle and end. For any number of reasons, folks may never get to the end of your About Me Page, but that doesn’t mean they don’t want to learn more about you and how you can help them. On my about me page, I made sure to include two CTAs within the text, as well as two visual CTA buttons. So I am giving folks a number of opportunities to move on with me. This is kind of a bonus section and an extension on the call to action. If you have products, online courses, services or programs you want to share with your new readers, this is a great place to shine a light on those puppies. You can check out how I did this on my About Me Page plus it’s a great way to earn some passive income. Remember, your about me page is your most popular page. Leverage the traffic you get to get more eye balls on your products and give your sales a boost. So there you have it. The seven super simple steps to creating a lead-generating About Me Page. Remember, your About Me Page doesn’t have to be a novel. Fill it with useful, personality-driven content that gets people to double down on taking the next step with you. P.S. WANT A FREE ACTION SHEET THAT WILL HELP YOU CRAFT THE PERFECT ABOUT ME PAGE? Did I hear you say heck yeah! 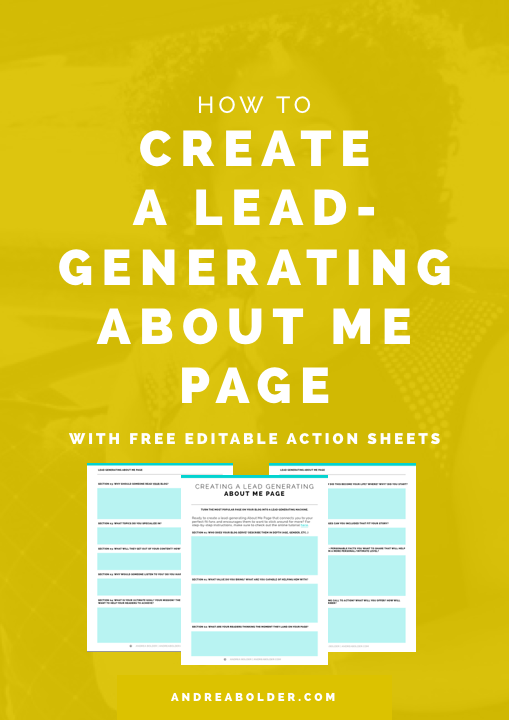 Well, you’re in luck because I have an editable action sheet that will help you whip up a lead-generating about me page in no time flat! To get the action sheets, click here to get instant access or click one of the cute images you see above or below. 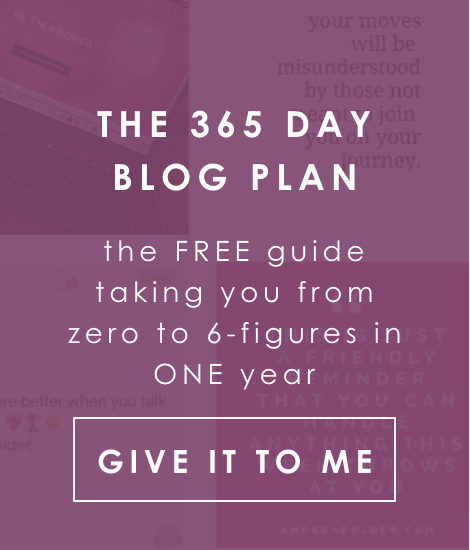 Signing up will also give you access to my FREE Champion’s Biz + Blog Library which is literally busting at the seams with action sheets, e-books, guides and colorful resources for brand-building bloggers and biz owners like you! Great checklist! I am going to check my About page against these and see what needs to be changed. Thanks. Awesome! Let me know how the changes work out for you! Another great post! I never considered including my services on my about us page. Guess I have some work to do! Yes! It’s the perfect place to out your products and services. People want to know about those just as much as they want to know about you! Thank you for sharing ! I need to update my list now ! As usual I love all the information you put in your posts! Thank you Charlotte. So glad you enjoyed the post! My about me page definitely needs some sprucing up. I think this goals for the new year. Thanks for the useful information. Yeah! Take a weekend and knock it out! Great post. I’ll be keeping these things in mind when creating my about page. Boom! There you go! Keep me updated on the changes you make and how they work out. Great tips! I think it is time to revisit my about me page again, so this will certainly help! Thanks for this! You have made a daunting task seem easy! Reading this makes me want to go back and work on my own “about me” page. You are so welcome. Glad you got some value out of this post. I’m sure once you implement a few of these tips your about me page will be that much better! I like the idea of sharing a personal story. Honestly, when I go to someone’s about me page, if they don’t have any details (not even a picture), I don’t stick around. I want to know the person I may end up working with is real and has personality! Exactly. People want to know more about who we are not just what we sell. It’s the personal touches that make folks want to learn more! This is a great post Andrea! I love the part about adding in your paid offers too! Super smart!! Thanks Lindsey! Yes we gotta remember we’re in business too! Gotta include those paid offers. May be the only time someone who visits your site actually sees them. Have to take advantage of EVERY opportunity to connect!